Welcome Spring With A Tour of Woodstock Vermont's Sugarbush Farm! Sample Maple On A Tour Of Woodstock, Vermont’s Sugarbush Farm! Sugarbush Farm, in Woodstock, VT, is famous for its delicious, locally made cheeses, maple syrup, preserves, and more. Come take a tour and enjoy samples of their farm-fresh fare! Last post we discussed maple sugaring time and the Maple Madness event that takes place in Woodstock near the end of March. Another great way to celebrate spring’s sweet harvest is with a visit to a family farm known for its pure Vermont maple syrup? 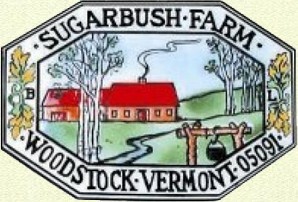 Sugarbush Farm is a 550-acre, fourth-generation family farm located right here in Woodstock, VT. The farm has been run by the same family since 1945. In 1995, they were honored by the American Cheese Society with a blue ribbon for the best smoked cheese in the country. While Sugarbush Farm is known as a cheese-lovers paradise, they also produce a variety of fruit jams and preserves, as well as their own maple syrup. With the scent of maple in the air from all the sap being boiled down to syrup, who can resist a chance to visit a sugar house? A tour of Sugarbush Farm provides an opportunity to do just that! Visitors to the farm will be able to watch and learn about the syrup-making process from the family. Walk the trail to see the farm’s 7000 tapped maple trees and see how the sap is collected. Then it’s off to the sugarhouse where the sap is boiled down with a wood fire. Here you will learn about the four different grades of Pure Vermont maple syrup and sample each as well. Yum! You can also take a tour of the farm’s cheesemaking process and see how they hand wrap and hand wax their cheeses. You can also enjoy samples of the over 14 cheeses they have on hand! Be sure to visit the farm store, too, for a variety of Vermont-Made products. Many of what they sell was made right here on Sugarbush Farm but they also sell lots of other great locally made items. Visitors to Sugarbush Farm also have the opportunity to meet some of the animals on the farm. There are often calves, chickens, rabbits, sheep, and goats to meet, depending on the temperature and season. Just enjoying the beautiful views around the farm is often considered treat enough to make the trip worthwhile. You can also visit Sugarbush Farm online. Deer Brook Inn is also located in Woodstock, VT and is only 20 minutes from Sugarbush Farm. Our 1820’s farmhouse inn is the perfect place to let your hair down and put your feet up. Our “Vermont casual” inn is conveniently located for easy access to the areas most popular destinations. Killington and Okemo ski areas, the Appalachian trail, covered bridges, shops, galleries and more. All at your fingertips. Come make our Vermont B&B your home away from home. Book your stay at Deer Brook Inn today!